Cleaning and polishing the vinyl floor does not require the use of chemical-based cleaners. In fact, many homeowners are using the same green cleaning recipes used by previous generations for a simpler, effective way to shine the floor. A homemade mopping solution made with vinegar brings out the shine on a vinyl floor. One of the best solutions for shining a vinyl floor is household white vinegar. Adding baby oil to the vinegar solution removes grime and increases shine, according to the Earth Easy website. To make a vinyl floor cleaning and shining solution at home, mix together 1 cup of white vinegar, 5 drops of baby oil and 1 gallon of warm water in a large bucket. The acidity in white vinegar helps break down any dirt, grime or buildup on the surface of vinyl flooring. 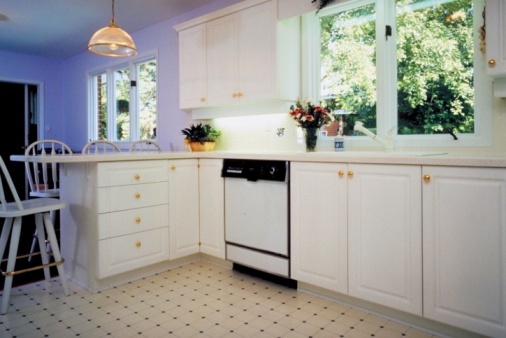 This buildup often contributes to vinyl flooring looking dull. A small amount of baby oil acts as a natural floor polish. Mop the floors with the vinegar-based solution. Rinse with clean water to remove any excess solution and reduce the risk of slipping on freshly oiled floors. For heavily soiled floors, mop with a solution of warm water and liquid dish detergent, suggests the Care 2 Healthy Green Living website. Finish by using the vinegar solution to bring out the shine.